Twenty-five days. that's how long it took Dr. Shinya Yamanaka of Kyoto University to undo more than three decades of the exquisitely programmed biology packed into a middle-aged woman's cheek celland just maybe change the world. In those three weeks, Yamanaka turned back the clock on an aging cell. In the ultimate feat of reprogramming, he tricked it into acting like that wonder of cellular shape-shifting, the embryonic stem cellcapable of dividing, developing and maturing into any of the body's more than 200 different cell types. What's remarkable is that Yamanaka wasn't the only one. On the same day shortly before Thanksgiving that he published his milestone in the journal Cell, James Thomson, the pioneering molecular biologist at the University of Wisconsin who in 1998 discovered the first human embryonic stem cells, reported similar success in Science, reversing development in foreskin cells from newborns. The papers were a culmination to a year of remarkable stem-cell firsts, a year in which scientists surged ahead of ethicists and politicians in finding ever more clever ways to generate stem cells. This summer, working with mouse embryos, researchers nurtured a stem-cell line from the earliest stage of development yet: the one-celled zygote. Others propagated stem cells from a single cell extracted from a days-old eight-cell human embryo, leaving the embryo itself intact and developing. And this fall, Oregon scientists reported they could grow embryonic stem cells from an adult monkey, inching closer to perfecting the process with human cells. But those three breakthroughs, newsworthy as they were, still relied on living embryos: tiny bits of inchoate life fraught with all the familiar ethical issues. Yamanaka's and Thomson's work sidestepped that altogether, raising the tantalizing question, Is the long-raging stem-cell debate at last over? Yamanaka thinks it might be. "We can now for sure begin to generate patient-specific stem cells," he says. "And we should be able to use them in cell-transplant therapy." Other giants of the field seem to agree. Ian Wilmut, the scientist responsible for cloning the first mammal, Dolly the sheep, has announced that he is abandoning the egg-hollowing, gene-replacing technique that made him a pioneer, noting that "changing cells from a patient directly into stem cells has got so much more potential." No embryos, no eggs, no hand-wringing over where the cells came from and whether it was ethical to make them in the first place. Stem cells generated by Yamanaka's or Thomson's method are ideal for producing transplant cells not just because they are free of political and moral baggage. Since they originate in a patient, they can also give rise to any type of body tissue and then be transplanted back into the donor with little risk of rejection. All it took, in the end, was a little gene-tinkering and a dousing of protein factors that together nursed cells back to an embryonic state in which everything is biologically possible. "I think this is the future of stem-cell research," says Dr. John Gearhart, the biologist from Johns Hopkins University who first isolated human fetal embryonic stem cells. "It's absolutely terrific." It wasn't always obvious that such direct reprogramming could ever be achieved, however. Dolly demonstrated that it was possible to reset an aging cell to become an entirely new being. But even after Dolly's birth, says Thomson, attempting direct-reprogramming experiments "was a little bit of a stupid thing to do, because everyone thought it couldn't possibly be this simple." There could have been 100 protein factors and an unknown amount of gene-jiggering to recalibrate the cell properly, and all of them would have to be discovered by trial and error. "When I started this work, I thought it would be a 20-yearnot a few-yearproblem," Thomson says. Fortunately, things were easier than that. The fountain-of-youth factors that he and Yamanaka use turn out to be well-known genes active in early development. Both the Yamanaka and the Thomson groups relied on inserting a separate set of four genes into aging cells, using the most efficient genetic bullies around: viruses, which penetrate a cell's membrane and insert new genetic software into its nucleus. 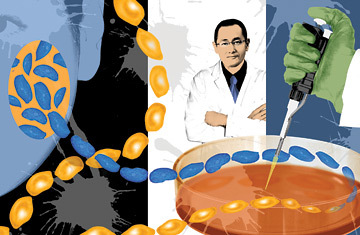 The technique is comparatively efficientabout one stem-cell line per 5,000 cells, in Yamanaka's case, or one stem-cell line for each cultured petri dish of cells. While that may not sound impressive, it's a sure thing compared with the painstaking method that produced Dolly. "The efficiency puts it well within the realm of technical feasibility," says Dr. George Daley, a stem-cell expert at Children's Hospital in Boston and the Harvard Stem Cell Institute. Still, that doesn't mean these cells are ready for transplant into patients. The viruses used to ferry the genes are retroviruses and lentiviruses (the families that include HIV which can introduce genetic mutations that can cause cancer. But, says Dr. Douglas Melton, co-director of the Harvard Stem Cell Institute, "eventually we may not need to add genes or viruses at all to cells. It will be possible to find chemicals that tickle the cells to turn the right pathways on." The fact that the two groups came up with a different set of factors makes clear that there are probably myriad ways to reprogram a cell. And sorting out those methods to determine the best ones will take timewhich is why some experts believe that stem cells from embryos will remain useful for a while. Although both Yamanaka and Thomson have induced their cells to develop furtherinto heart and nerve cells, among othersthey admit that we still know too little about how this development process works to exploit the method's full potential. "My hope is to avoid using human embryonic stem cells," says Yamanaka. "But at this point, I am not 100% sure that is possible yet. So we have to continue studies." Given the speed with which researchers are making discoveries in the field, don't be surprised if more of these breakthroughs appear in TIME's A-to-Z guide to medical highlights next year. In the meantime, what follows is some of the other big stories that made 2007 the exciting and pathbreaking year it was.